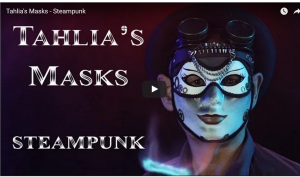 Take a look at this awesome steampunk mask video. It was shot, like the others (see the masquerade page) by the very talented Rose of Velvet Wings Media. Don’t forget to pop over to the You Tube link and like and share it. 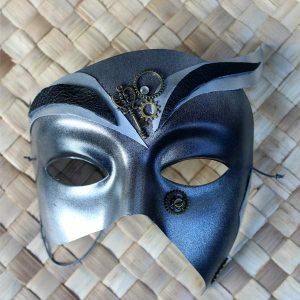 This masquerade masks video is of some of my renaissance style full-faced masks, shot in my studio by Rose of Velvet Wings Media. You can see from the video how awesome these masks would look for your next cosplay event! Comments? 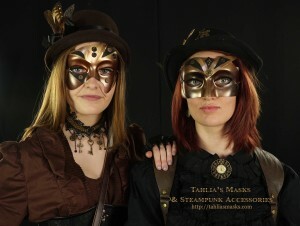 Here’s another photo from the steampunk shoot. This steampunk girl with a ray gun (made by yours truly) is wearing one of my felt fedora hats, and a steampunk lace collar and cuffs.